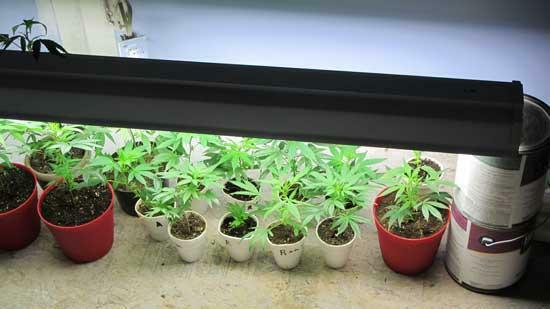 These marijuana plants were found growing inside the resident of Christopher and Mary Singer. Teamwork between the Woodbury Police Department and the Cannon County Sheriff’s Department led to the arrest of three individuals last week on drug-related charges. The first joint operation between the WPD and CCSD took place on Monday, July 25, at 418 Murfreesboro Road, Woodbury. Following a search of the residence, David Brad Young was arrested on charges of initiating the process to manufacture methamphetamine, manufacture of a Schedule VI drug (marijuana), maintaining a dwelling for the use, keep or resale of controlled substances and unlawful possession of drug paraphernalia. Law enforcement officers confiscated 35 marijuana plants from the residence along with an assortment of items used in the manufacture of methamphetamine. Participating in the investigation were Woodbury Police Chief Tony Burnett, Cannon County Sheriff Darrell Young, WPD Assistant Police Chief Kevin Mooneyham, CCSD Investigator Anthony Young, WPD patrolmen John Fesmire and Brent Brock and CCSD deputies Reed Bryson, Eric Moss and Steve McMillen. “The meth making operation had obviously been going on for some time,” Chief Burnett said. Young’s bond was set at $153,000. His initial court date is Sept. 27. The second coordinated bust conducted by the CCSD and WPD took place on Tuesday, July 26 at 436 Williams Lane in Readyville. A total of 124 marijuana plants were discovered at the home of Christopher L. Singer and Mary K. Singer. CCSD Investigator Young said marijuana was allegedly being grown by the Singers both inside and outside of their residence. Both Singers have been charged with manufacturing marijuana, maintaining a dwelling for the purpose of manufacturing marijuana, and possession of drug paraphernalia. Bond for each was set at $5,000. Their initial court date is Sept. 6. Sheriff Young, Chief Burnett, Investigator Young, Asst. Chief Mooneyham, Sgt. Randy Neal and Deputy Travis Turney participated in the investigation and arrest of the Singers. Just proves that they should be combined into one dept.Would put more cars patrolling the county,while giving the city residents the same coverage they have now.